The Saturday after Thanksgiving, both my sister and my older brother returned home with their families. 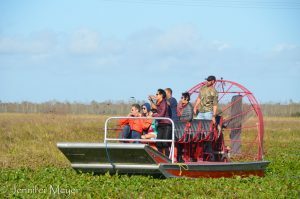 We weren’t leaving till Monday, though, and my brother Dave thought it would be fun to go on a swamp tour in an air boat. He drove us out to the Jean Lafitte National Historic Park, along with his wife and youngest son, Matthew, and we got tickets on one of the smaller boats. It was only us, Brian the guide, and two young men from France. Baby boomers will remember air boats in the 60s TV show “Gentle Ben,” about a ranger’s pet bear in the Everglades. They are powered by a giant fan at the back of the boat, which roars like an airplane engine. Because no part of the engine is submerged, the boat glides over the water almost like a hovercraft, and it can go in swampy areas that are filled with vegetation. We were given ear protection for to cove the noise, and away we went. When I think of a swamp, I think cypress trees and Spanish moss, murky water with green algae, snakes, alligators, and other creepy things. 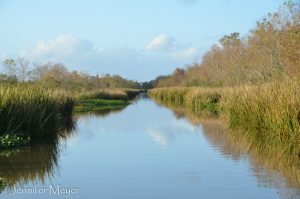 So I was surprised when our guide sped us across a river, through a narrow gate marked “no trespassing,” down lush green canals, then into a wide-open wetland. Like a marshy savannah. There were alligators, to be sure, but it was a beautiful, peaceful, expansive place. 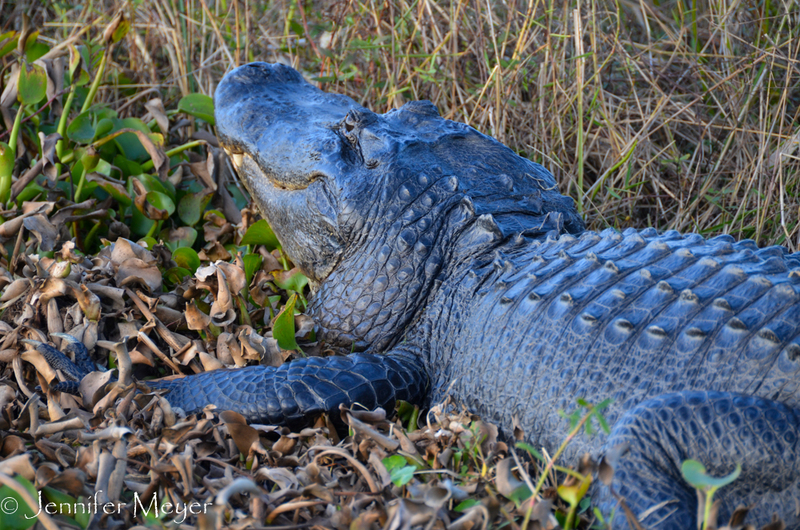 Alligators hibernate in the winter. 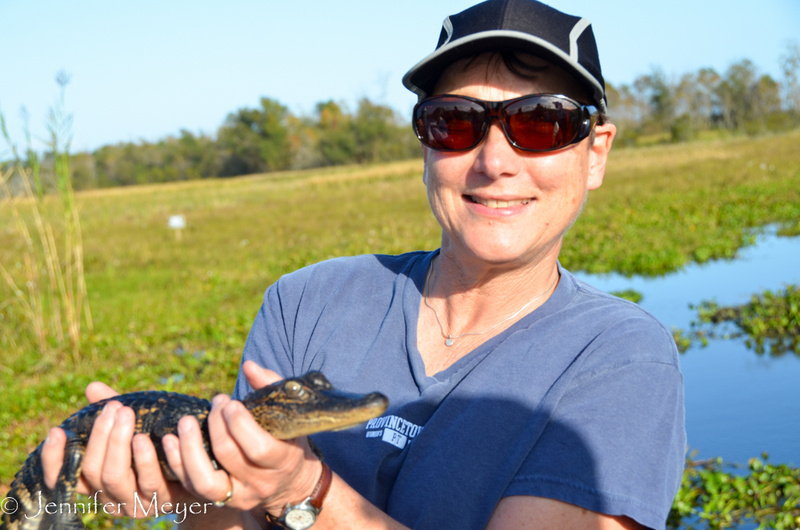 At least alligators in Louisiana. So we were lucky to see any at all. Because it was unusually warm and sunny, two had come out to sun on the dry land. The larger of the two was about 10 feet long, Brian estimated. We were able to get right up next to them and admire them while Brian talked. In summer, he lures alligators to the boat with marshmallows (because they float and are white), then feeds them chicken. Sometimes he will even lure one up on the flat part of the boat for a minute. But that would be a waste of good food today, he said, because the alligators had finished eating for the winter. To hibernate, they bury themselves deep in mud to stay warm, rising to take a breath every couple days. They wouldn’t eat again till spring. Brian drove us to into other sections of the swamp, through more through narrow gates marked private. I’m not sure who owns this swampland, if it’s all part of the national park, but it was huge, and it seemed to be connected with a whole infrastructure of canals that would disorient anyone who didn’t know this swampland intimately. At one point we stopped to view some nutria, which are giant, beaver-size rodents. We’ve got them in Oregon, too. They were introduced to both places for their fur. But once the fur trade bottomed out, nutria were no longer trapped. They became overbreeding, vegetation-destroying pests. Their presence in the swamps has become so problematic that the government put a $5 bounty on their tails. 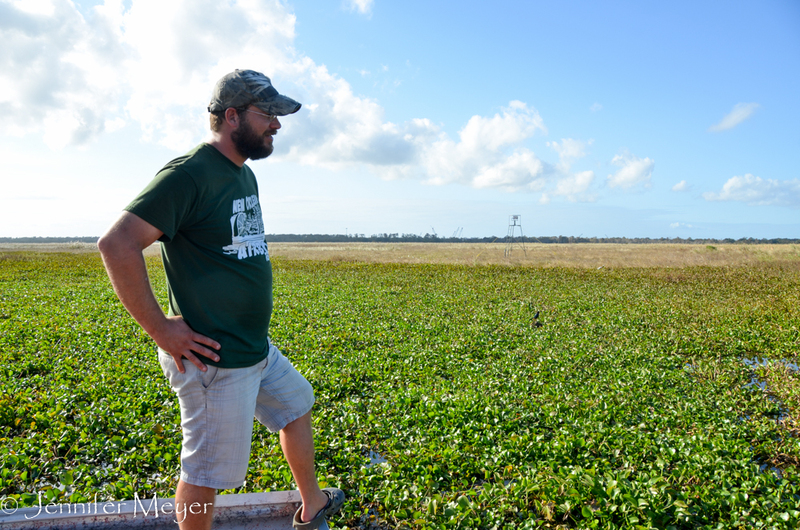 When the swamp tour business is slow in the winter, Brian and his buddies pick up the slack by hunting nutria. Last year they killed 3,500. I intentionally did not ask for details. Brian is Cajun and has lived in the Louisiana bayou his whole life. He told us stories of trapping and skinning nutria for fur with his grandfather when he was a kid, and eating the meat. “What’s it taste like?” I asked. He thought a moment. “Kind of like squirrel, actually.” As if that helps. Me and the little guy. n mass. Feeding animals marshmallows? Talking about the best way to kill animals. Capturing baby animals and passing them around to tourists. At times, I was cringing inside. But at the same time, I was fascinated by it all, and really enjoyed it. 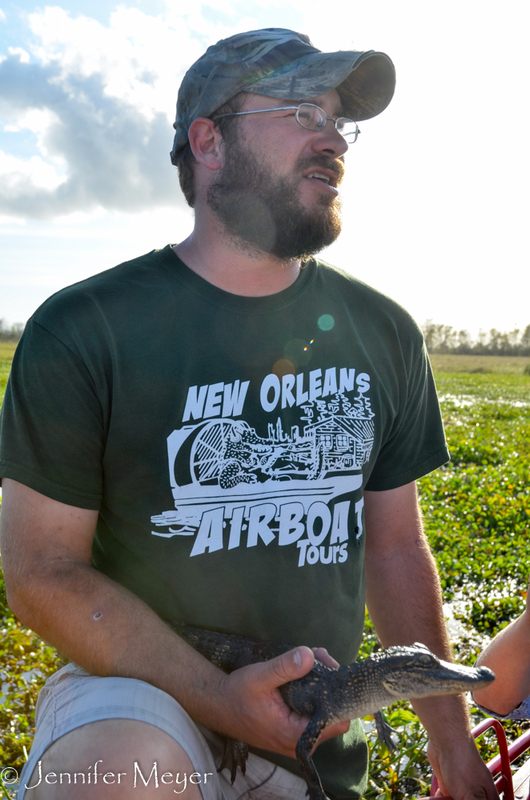 I liked Brian and loved hearing his stories about living in the bayou, listening to his deep Cajun accent. (If I closed my eyes, I’d swear he was black.) Instead of passing judgment, I just let myself be pulled into his world for an afternoon and imagine what his life has been like, living here. 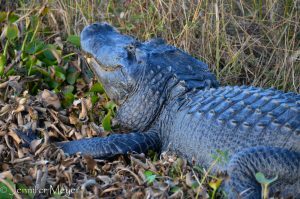 He clearly loves this bayou and all its wildlife with the kind of deep appreciation and respect that only someone who has spent his life living off of it can possess. I was grateful for our glimpse of his world. 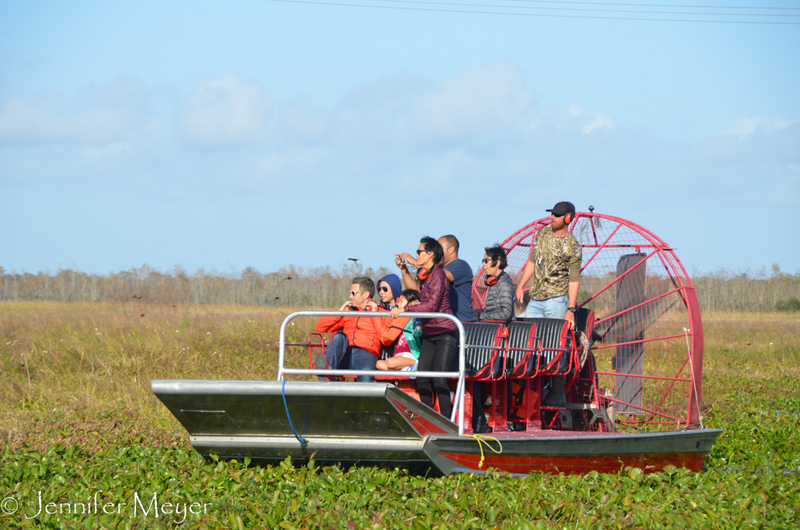 And I have to admit, riding in that air boat was fun!